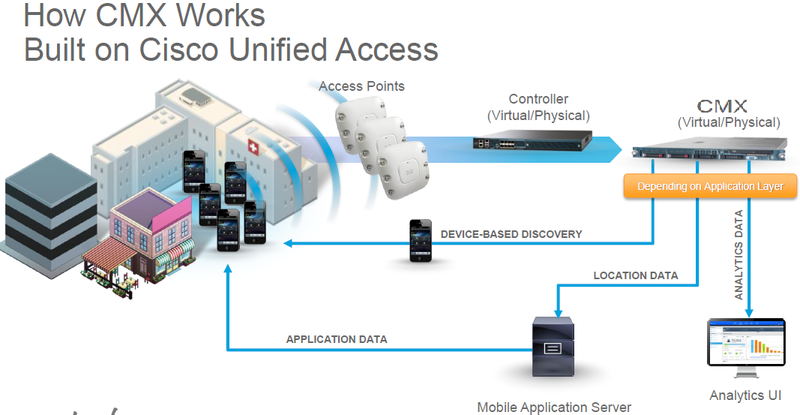 Connected Mobile Experiences (CMX) is Cisco’s WiFi location analytic solution to provide a value-added and personalized user experience to WiFi users. If you are familiar with Cisco Mobility Service Engine (MSE), then CMX is the new brand name for that service with some improved features. Specific to v10.x releases, Cisco has improved the scalability, performance of this platform compare to v8.x. Below is the architectural difference of those two versions. In this post we will look at “CMX Presence” and in next post we will look into “CMX – Location” Here is the CMX 10.2.0 Release notes which listed below new features . 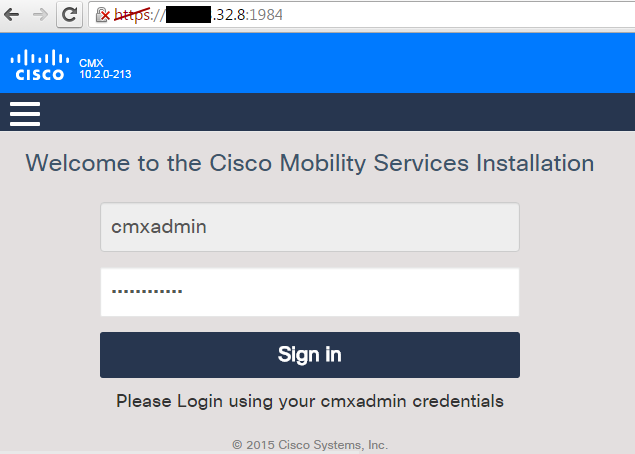 Once you install the CMX Application on either VM or Hardware (in my case I have used 3355 appliances), you can access GUI to install using https://cmx-ip:1984 as shown below. You have to select either “Presence” or “Location” functionality. You cannot have both function in the same CMX instance. Also note that “Presence” service does not require any maps (Prime Infrastructure is not a requirement). So it is suited for customers that does not have many buildings/APs at given location, still they want to WiFi clients presence analytic. Since I want to use this for “Presence” I have selected that option & continued. You will see below components get installed. In the next Setup page, it is expected you to enter PI credential (if you have WLC sync with a PI). Anyway in Presence, you should be able to work without PI, I will add controllers manually to CMX. First you have to get CMX MAC address and SHA1 or SHA2 keys and configure them on your controllers. You can use”cmxctl config controllers show” and “cmxctl config controllers add” CLI command (Here is the 10.2 CLI Command Reference Guide). You can use “show auth-list” output to verify that CMX MAC address & SHA2 key listed there. In IOS WLCs, you can do that as shown below. Once you enable NMSP you simply need to add CMX MAC address as username with SHA2 key as password. In CMX, you can add a NGWC (5760/3850/3560/etc) as shown below. You can verify the configured controller status using “cmxctl config controllers show” command. Once your WLCs added, you can log onto CMX GUI (https://cmx-ip) and do your presence analytic. (default admin/admin unless you have change it during initial setup). 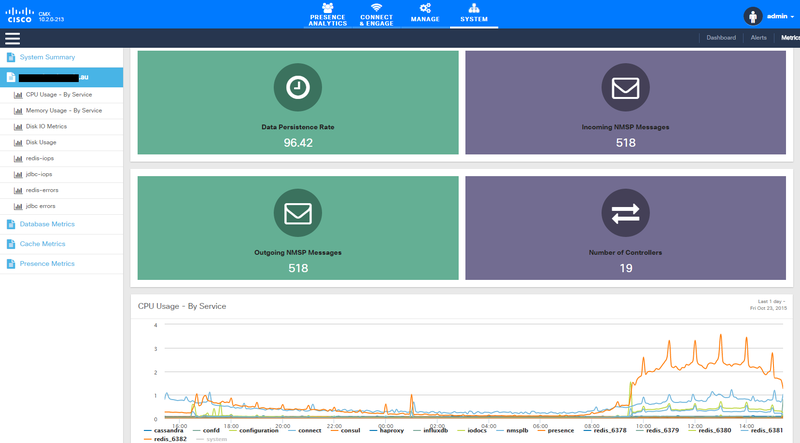 You can manage licenses/users/notifications in “MANAGE” page. 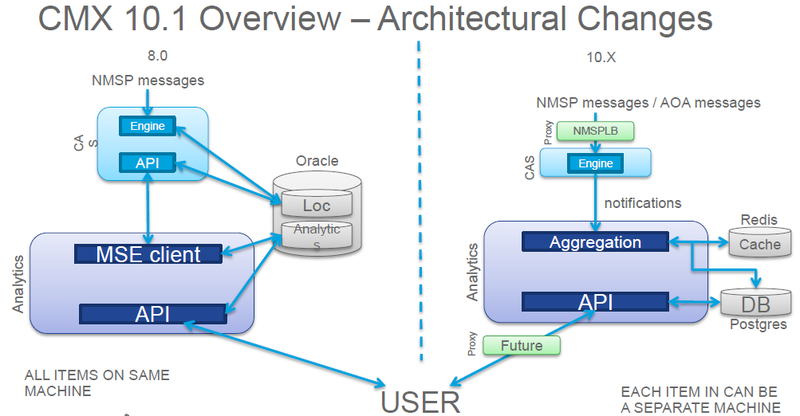 Note: CMX Analytics and CMX Presence Analytics cannot be used simultaneously. A CMX instance will use either location or presence. 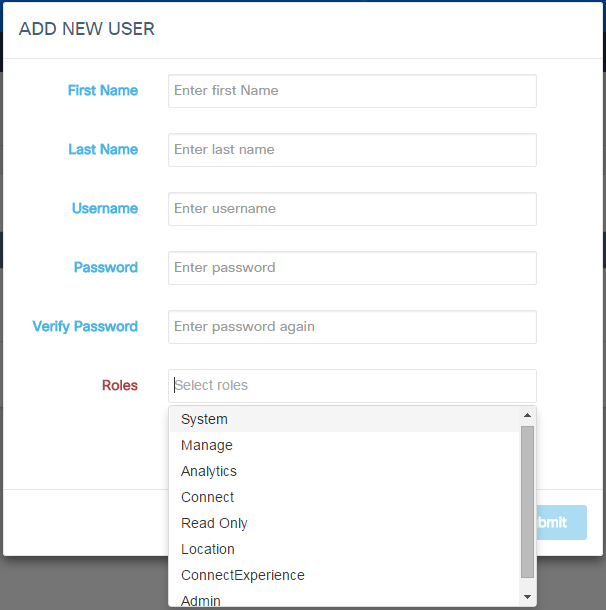 In the “Users” section, you can create different users and assigned them a specific role. You can click on “Manage” under “PRESENCE ANALYTICS” to configure your sites, add APs to your sites & other related configurations. You can create site individually (if you have small number of sites), otherwise you can import your site-list from a CSV file. Required format already available in information icon as shown below. Once you create your sites, you should be able to map your AP onto those sites. 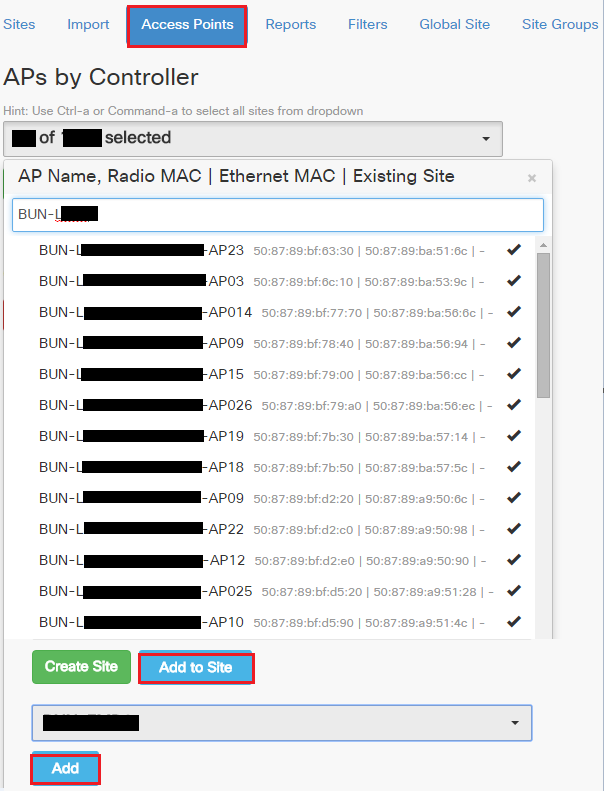 You can do that in “Access Points” menu by filtering your AP and adding to a configured site. You can use “CONNECT & ENGAGE” settings to create portal for your visitors (public guest users) based on sites you created. 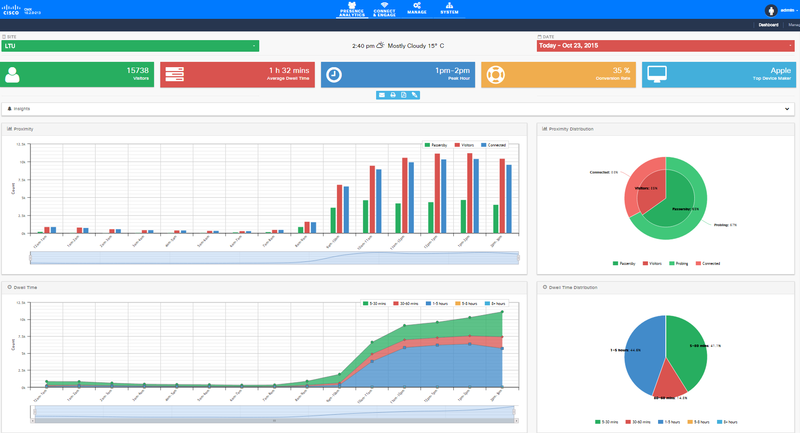 From the “SYSTEM” menu you can monitor your CMX system performance. In next post, we will see how “CMX-Location” service setup and its features. This require Cisco Prime Infrastructure with updated maps. what’s your suggestion about the design of the infrastructure? I have replied to this thread. Nice article and good explanations. Have you seen the example video Deakin have produced with CMX? Yes Dan, I have seen this. Good to see you make use of this CMX to enhance user experience. Hi I am trying to setup CMX10.2 for location only but I see issue between WLC and CMX. WLC is in inactive state. I have check ntp, snmp and all parameters but still status is inactive. tried deleting and re-adding it on both side but it did not help. any idea what else it could make the inactive. I am running 8.0.120.0 on cisco 5508 WLC. Does this SNMP string has R/W permission ? its working now. I had changed snmp from v2c to v3 then it started working. Thanks for your help and support. Need to delete maps for new AP count tried “cmxctl config maps delete System Campus SLC !st floor” it comes back with a syntax error. How to you put in the campus building and floor argument? it does not like the ! mark in place of a one but, unfortunately that is how it got added. any idea what could be happend? Best avenue to troubleshoot this is via TAC. Open a case & see how it goes. I have got the same problem. To solve it I enabled used SNMPv2c with Read-Write credentials on WLC. And it become active, started display access point in the map and user. No response from Server. It may be unreachable, or server is down or HTTPS connection to server failed. 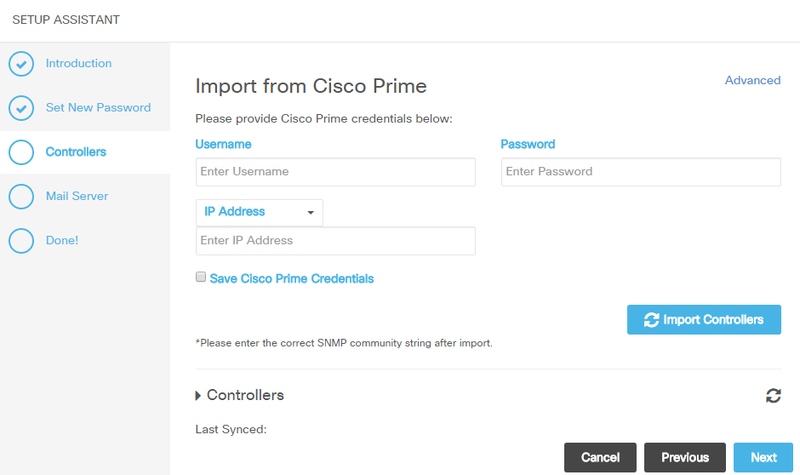 That you will do on CMX end only, give prime credential when configuring it on CMX. Are you planning write up on CMX location service as state on this article ? if so when? I will be working on production CMX deployment in April/May, I will complete the part 2 in that time frame. When i install cmx 10.2 and on function Presence . Can i switch to fanction Location later ? No you cannot, you need to have two instances. One for Presense & one for Location if you like information presented in both. Pls reach TAC & see, they may able to find exact cause for this. I cant import maps in Jpeg format in GUI and i got this error “CMX: System error” . please advise if any other format i have to use for maps. Kindly share the doc if you have ? BTW. Is PI required only for maps import (uploading maps to PI, calibrate and then add existing APs) or should it be constantly connected to CMX? With CMX 10.2.x , integration with PI is broken. You would expect location based reporting can be executed on PI, but it is broken. 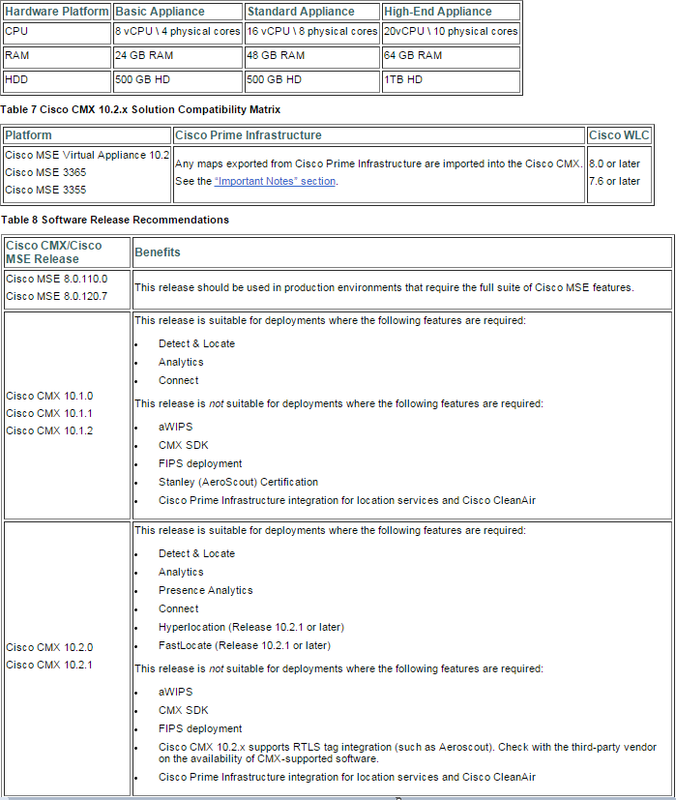 Do you have the installation guide to upgrade a MSE 3355 running 8.0.130 to CMX 10.2? How we can import maps individually to CMX 10.2 as we have export maps from old MSE 7.0 and need to import same one in CMX 10.2. We don’t have Prime Infrastructure in our network. I do not think this is supported. As far as I know maps has to be exported from Prime Infrastructure. Can you help me on the same.? you have some tips or know of any cisco document that allows me to advise me precisely to review regarding the location. Thanks for this wonderful blog its really helping us ..
Actually we have configured with location service , and imported all floor maps. Now i am struggling to get live logs in activity map , currently no client and AP are visible . So for that am I need to enable NMSP and add CMX MAC address as username with SHA2 key as password. So can you help me how to find CMX mac address and SHA2 key to add it on controller. I am not able to see mac address and SHA Key , can you help on the same. Great post, lot of learning. After i logged in, i clicked “location” and it took me to 2nd page where components were installed. Later i shutdown the server because i wanted to configure it later. Now when i have powered on server, i think i am somewhere in configuration of “location” services (i think from where i left before). How do i go back to initial screen where you choose between “Presence” and “location” ? I want to try “Presence” services first. You have to do a fresh installation again, then only you can choose between “Presence” or “Location”. Once you select it, there is no way to go back & change. Thanks Rasika for your quick reply. Do i have to factory reset the box ? Like begin from very start (configure CIMC and then run setup) ? No, if you have set up the CIMC port,then you can launch KVM console via that. You can boot from .iso file. what version of CMX you running ? Is it a consistent issue or happening time to time ?